Neal Patel, M.D., MPH, has been named chief medical informatics officer for the Vanderbilt University Health System. Patel, professor of Clinical Pediatrics, Division of Pediatric Critical Care Medicine, has served as the inpatient chief medical information officer since 2006. In his new role, Patel will provide leadership for translating VUMC health care delivery, quality and patient safety goals into informatics strategies to optimize the delivery of patient care. He will collaborate with operational and clinical leadership to foster systemic adoption and effective use of clinical applications to promote patient safety and high quality care across the continuum, and reduce the costs of care, in support of the VUMC mission. 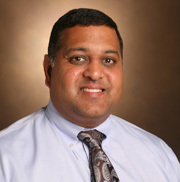 “I am pleased Dr. Patel has agreed to assume the critical role of chief medical informatics officer for the Vanderbilt Health System,” said Blackford Middleton, M.D., MPH, M.Sc., assistant vice chancellor for Health Affairs and chief informatics officer for Vanderbilt University Health System. “This role is central to the effective and continuous interface between health informatics and technology services, and our practicing clinicians, and our patients. Neal has been deeply involved in aligning informatics and technology strategies with VUMC business strategies, and will now help to coordinate activities of all clinical informatics staff. In addition, he will assume the leadership role for the Innovation and Integration Team,” Middleton said.